As electric floor heating continues to get easier to use and install, it’s gaining more and more in popularity. Systems are increasingly integrating with smart thermostats and home automation systems, making them easy and convenient to use. And new membranes are making installation faster, easier and more functional than ever. For instance, WarmlyYours offers its Prodeso Installation Membrane, which uses square-shaped reliefs to properly space the heating cable and hold it in place. It allows installation of both the floor-heating system and flooring to be completed in the same day. Plus, the membrane itself doubles as an uncoupling and crack isolation membrane, and — with the right accessories — can even be waterproofed. Advances like these are leading more and more people to invest in floor-heating systems. However, the more people that install electric floor-heating systems, the more the industry learns about the common installation problems they face. That’s why the National Tile Contractors Association (NTCA) focused part of its 2016/2017 NTCA Reference Manual on radiant heat issues for tile and stone installations. Below are a few of the most frequent issues faced by installers along with ways to prevent or solve them. 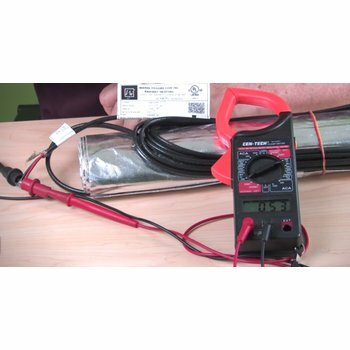 Using a digital ohmmeter throughout the installation process will ensure the heating cable stays in good working order. Issue 1: The heating system will not turn on. One of the most frustrating things an installer can face is completing a floor-heating installation and experiencing a failure in the system. This typically happens because the heating cable has been nicked or damaged at some point during the installation process. Solution: Use testing devices and a repair kit. 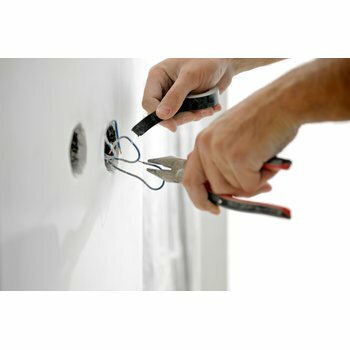 To prevent causing damage to the heating cable, installers should use both a digital ohmmeter and Circuit Check throughout the process to ensure that the cable remains in good working order. The installation manual provides details on when and how to do this properly. If the damage has already been done, the only solution to this problem is to find and fix the break in the cable. WarmlyYours offers a splice/repair kit online. A professional can use a thermal camera to locate the break so that only part of the flooring needs to be removed to fix the problem. Verify the capacity of your electrical panel before you begin installing your floor-heating system. Issue 2: The thermostat is overheating. A scary issue to run into after installation is a thermostat that overheats or even melts when the radiant heating system is turned on. This is generally caused by overloading the circuit. Solution: Verify the voltage and square footage of the heating system before you begin. To ensure that you don’t overload your thermostat, the first thing you should do is verify the voltage of your electric floor-heating system. The voltage should match that of your thermostat and circuit. Secondly, you need to make sure that your circuit breaker has enough available amperage for the floor-heating system you’re trying to install. Generally, if you’re trying to heat more than 120 square feet, you’ll need a larger breaker panel and additional controls. However, if you live in an older home, you may have to upgrade your panel when heating even a small room. It all depends on the capacity of your home’s breaker box. To be safe, WarmlyYours recommends using a dedicated circuit for your floor-heating system — no matter the size of the heated area. Finally, the issue could be as simple as loose wire nuts. If the wire nuts have not been sufficiently tightened, your thermostat could overheat. Have a licensed electrician connect your floor-heating system to your thermostat to avoid this problem. Use your free custom installation plan from WarmlyYours to ensure proper layout. Issue 3: Heat is being unevenly or inconsistently distributed. If you’re noticing that some areas of the floor are warmer than others, your heating cable was likely not spaced correctly. On the other hand, if the entire floor seems colder some days than others, you’re probably dealing with a lack of insulation. Solution: Follow your installation plan and always insulate on a slab. 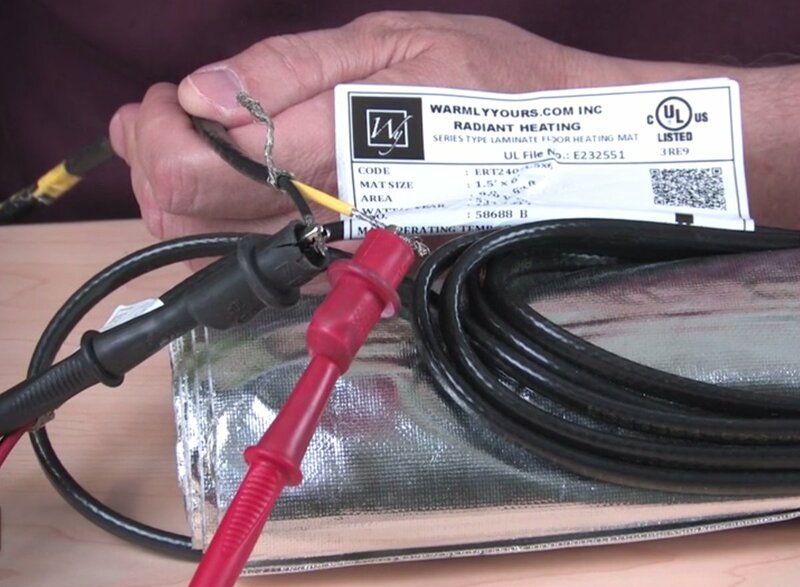 WarmlyYours provides every customer with a custom installation plan that shows how the heating element should be laid out to ensure proper spacing and even heat coverage. By following your plan, you can count on having evenly distributed heat throughout the room. If you’re heating on a concrete slab, you should be sure to use a cork or synthetic cork underlayment to prevent the slab from stealing your heat. By placing a layer of underlayment between the slab and your radiant heating system, the heat generated will travel upward through the floor (as planned) instead of downward into the slab. to start up your radiant heating system earlier. Issue 4: The grout is weak. If you’re positive you mixed and installed your grout correctly, you might be baffled when you notice powdery or weak grout lines after installation. The main reason for this happening is that the material was not given enough time to cure. Solution: Allow enough time for the materials to cure. In general, do not plan to turn on your radiant heating system for at least 7 days after installation. The grout, thinset or self-leveling cement needs time to cure before being exposed to significant heat. The exception is using a Prodeso Installation Membrane. This membrane does not require as much time to cure because unmodified thinset is used between the membrane and the tile. Unmodified thinset has the ability to cure significantly faster than modified thinset, allowing the entire installation to be completed within a day. 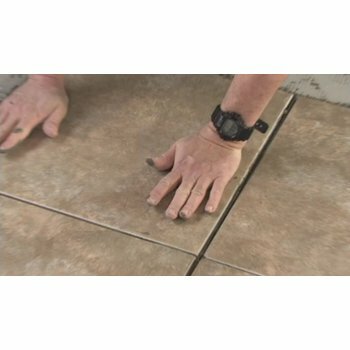 Using a mechanical leveling system will prevent tile lippage. Issue 5: There is excessive tile lippage. If you feel the edges of any of your tiles when you’re walking, you’re experiencing excessive tile lippage. This happens when the tiles are unevenly installed. Solution: Use enough thinset or self-leveling cement and employ a mechanical leveling system. First, you should make sure you’re using the proper amount of thinset or self-leveling cement. This material should completely cover the radiant heating system. Consult your installation manual for the precise amount to apply. To ensure you end up with a perfectly level tile floor, you can opt to use a mechanical leveling system like the Spin Doctor tile lippage control system. This system uses threaded spacer posts and caps to keep the edges of the tiles level with each other, resulting in zero tile lippage. For more tips and tricks for resolving floor-heating issues, check out the NTCA’s website at www.tile-assn.com.